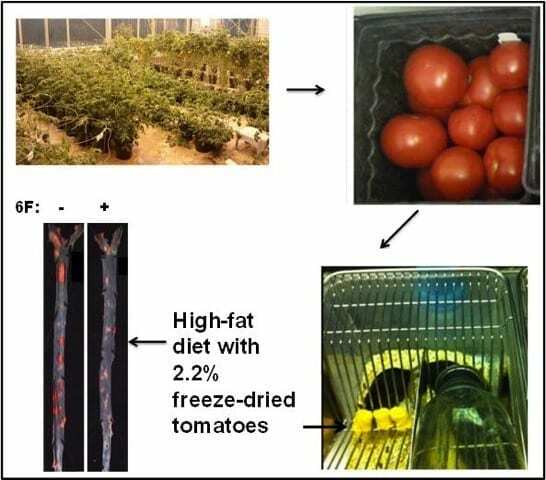 University of California Los Angeles (UCLA) researchers have genetically engineered tomatoes to produce a peptide, a compound containing two or more amino acids linked in a chain, that causes the tomato to imitate the actions of good cholesterol when eaten. A study was published in the Journal of Lipid Research that proved the peptide in tomatoes actually worked, after they fed them to a group of mice and found that they had less inflammation and plaque build-up in their arteries. The tomatoes were fed to the mice ground up and freeze-dried.